This is the public profile of Konstantin Achkov for LOCK, Additional information and high-resolution images are available for accredited press members, to access additional information about Konstantin Achkov for LOCK please login as a press member. About Konstantin Achkov for LOCK : For Konstantin Achkov, as a sculptorer himself, there is no major difference between art and design. The only differences he sees is in overcoming different problems. 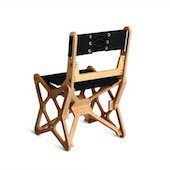 For him the chair is a functional sculpture, multiplied many times. Press Members: Request an exclusive interview with Konstantin Achkov for LOCK.